A plant of the cabbage family, broccoli is low in calories and high in fiber, vitamins and minerals that offer numerous health benefits. For optimal health, according to the publication "Dietary Guidelines for Americans, 2010," you should consume 2 1/2 cups of vegetables every day if you are on a 2,000-calorie-a-day diet. Including a 1/2-cup serving of broccoli in your daily menu can help you achieve this goal. 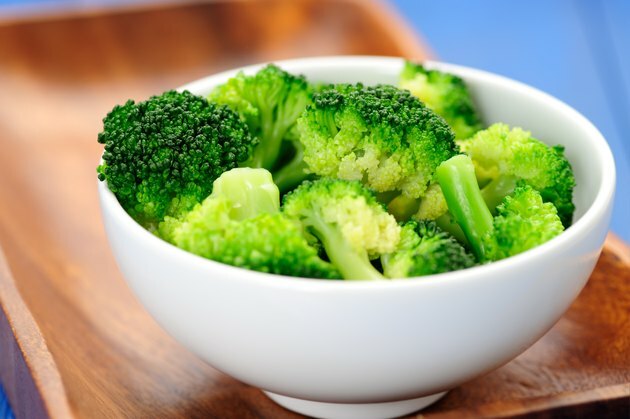 Broccoli is low in calories, with only about 27 calories in a 1/2-cup serving of the cooked vegetable. It also contains respectable amounts of vitamins and minerals. A 1/2-cup serving of cooked broccoli provides 50.6 milligrams of vitamin C, 110 micrograms of vitamin K and about 1,207 international units of vitamin A. Vitamin C is needed for the growth and repair of your body tissues, while vitamin K plays an important role in blood clotting. Vitamin A is essential for good eyesight. Broccoli is rich in beneficial minerals, including potassium, with 229 milligrams in a 1/2-cup serving, and calcium, with 31 milligrams per 1/2 cup. Your cells, tissue and organs need potassium for optimal functioning. Calcium helps develop and maintain strong bones and teeth. Both forms of dietary fiber -- insoluble and soluble -- occur naturally in broccoli. Insoluble fiber accelerates the movement of food through your stomach and helps keep you regular by adding bulk to your stool. Soluble fiber dissolves in water to form a gel in your digestive tract. This slows digestion, and your stomach and intestine are unable to fully absorb nutrients such as sugar and starch. As a consequence, cholesterol levels sink, which may help protect against stroke and heart disease. According to the University of Maryland Medical Center, eating foods high in soluble fiber, such as broccoli, may help improve glucose tolerance in people with diabetes. A 1/2-cup serving of cooked broccoli has a total fiber content of 2.6 grams. The recommended daily intake of dietary fiber is 25 to 30 grams. Broccoli is a good source of sulfur-containing compounds called glucosinolates, which break down in your body to form isothiocyanates. Isothiocyanates stimulate enzymes in your body that help destroy toxins and carcinogens, states the Linus Pauling Institute. Broccoli also contains a compound called indole-3-carbinol, which produces diindolylmethane, or DIM, when it comes in contact with gastric acid in your stomach. Because of its strong anti-cancer properties, DIM may hold promise in preventing breast and prostate cancers, reports Memorial Sloan-Kettering Cancer Center. According to a research published in the March 2009 edition of the journal "Clinical Immunology," sulforaphane -- a chemical found abundantly in broccoli and broccoli sprouts -- may help protect against respiratory inflammation that leads to conditions such as chronic obstructive pulmonary disease, asthma and allergic rhinitis. The compound sulforaphane augments the production of antioxidant enzymes in the airway, providing protection against the assault of free radicals that you breathe in daily in tobacco smoke, diesel exhaust, polluted air and pollen. Free radicals can cause tissue damage, leading to respiratory conditions. Furthermore, the antioxidant enzymes stimulated by sulforaphane may help block the harmful effects of air pollution, says Dr. Marc Riedl, the study's principal investigator and an assistant professor at the David Geffen School of Medicine at the University of California, Los Angeles. Riedl recommends making broccoli and other cruciferous vegetables a regular part of your diet.